Also serving communities of Plattsmouth, Nebraska City. There are 9 Assisted Living Facilities in the Bellevue area, with 3 in Bellevue and 6 nearby. The average cost of assisted living in Bellevue is $3,200 per month. This is lower than the national median of $3,346. To help you with your search, browse the 48 reviews below for assisted living facilities in Bellevue. On average, consumers rate assisted living in Bellevue 4.3 out of 5 stars. Better rated regions include Council Bluffs with an average rating of 4.6 out of 5 stars. Caring.com has helped thousands of families find high-quality senior care. To speak with one of our Family Advisors about assisted living options and costs in Bellevue, call (855) 863-8283. The city of Bellevue, a suburb of Omaha located in Sarpy County, has been named the "Most Underrated Town in Nebraska" due to it's growing economy and natural landscape. Home to around 52,993 people, the senior population, aged 60 and up, is about 15-percent. To accommodate them, Bellevue offers three local assisted living facilities (ALFs) and six nearby. Each community is regulated and licensed by the Nebraska Division of Public Health, Department of Health and Human Services, Department of Licensure and Regulation. The cost of living in Bellevue is ranked a 91, comparably cheaper than the 100-point national average. Seniors on a limited-income may need to consider that while less expensive than the national average, the city is ranked more costly than the state, which has a median of 88-points. This rise is seen mainly in transportation and health care, where both expenses are higher than most places nationally and statewide. The city of Bellevue has violent crime rates that are 189 percent lower than other neighborhoods in the nation and 110 percent lower than nearby towns. However, seniors concerned about safety could be hesitant to move to a city with a 110 percent higher crime per square mile than most national cities. Seniors living in Bellevue may find the cold, frigid winters dangerous with average temperatures ranging from 17 to 45 degrees. Seniors may also need to consider the elevated levels of rainfall that can lead to slippery surfaces during the summer months, averaging between 3 to 4 inches from May through August. Locals experience slightly better air quality, by 3 percent, when compared to the national median. The better air quality and 14 percent better pollution levels make it easier for seniors who have respiratory illnesses to breathe. The town of Bellevue, considered part of the Omaha region, gives residents access to the Metro Transit Authority of the City of Omaha, which runs through Ralston, LaVista, Bellevue and Papillion, Nebraska and Pottawattamie County in Iowa. The Metro also offers senior discounts on both cash fares and ride cards. Bellevue has an array of community resources for seniors, including the Bellevue Senior Community Center, an organization that enhances the quality of life of resident seniors through recreation, companionship, education and nourishment at its local center. Assisted Living costs in Bellevue start around $3,200 per month on average, while the nationwide average cost of assisted living is $4,000 per month, according to the latest figures from Genworth’s Cost of Care Survey. It’s important to note that assisted living rates in Bellevue and the surrounding suburbs can vary widely based on factors such as location, the level of care needed, apartment size and the types of amenities offered at each community. Bellevue seniors seeking financial aid have options through two state programs, including the Medicaid 1915(c) Home and Community Based Services Waiver (HCBS) and Supplemental Security Income (SSI) program. To see a list of free assisted living resources in Bellevue, please visit our Assisted Living in Nebraska page. 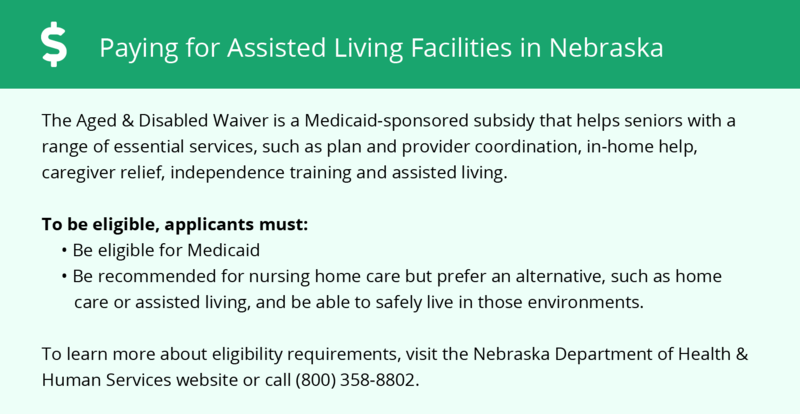 Bellevue-area assisted living communities must adhere to the comprehensive set of state laws and regulations that all assisted living communities in Nebraska are required to follow. 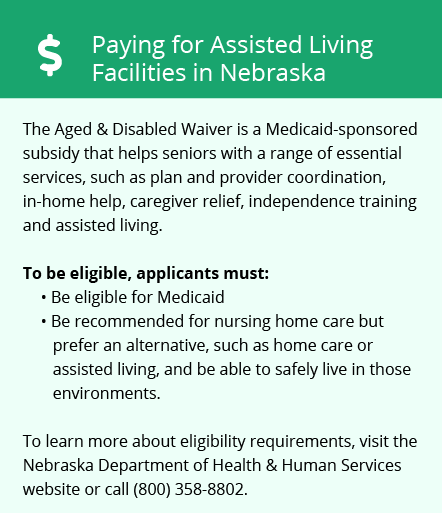 Visit our Assisted Living in Nebraska page for more information about these laws.